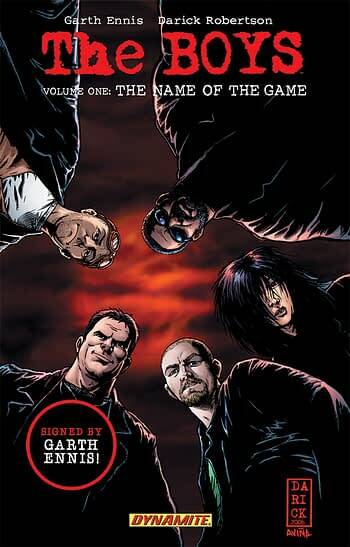 With production on The Boys live-action television series firing up, Dynamite has announced a one-time deal, offering all 12 volumes of The Boys series signed by writer/creator Garth Ennis at the regular cover price This is a chance for fans of the series to get the whole run, including mini-series, and have them all signed by Ennis. Production on a live-action television series has begun with Erik Kripke, creator of Supernatural at the helm and the Preacher team of Evan Goldberg and Seth Rogen directing. The series will feature Star Trek’s Karl Urban as Billy Butcher, Hunger Games’ Jack Quaid as Hughie Campbell and just added Elisabeth Shue as Madelyn Stillwell. The Boys Garth Ennis Signed Editions will be solicited in the June Previews catalog and scheduled to ship in August of 2018.